Choice of case-sensitive, case-tolerant and fuzzy matching. 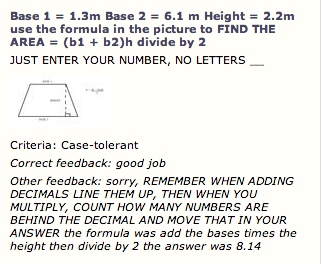 Permit multiple correct answers, each with its own feedback statement. 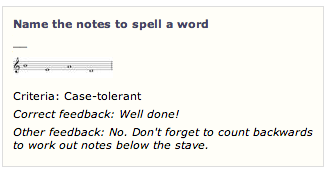 Acknowledge multiple specific incorrect answers (such as common misspellings), each with its own feedback statement. A question title that can be hidden from students – very useful for managing questions and building quizzes. Keep the answer short – one word or less (e.g. a suffix). Longer answers invite typos* and you will see 0% correct answers. Put the gap to be filled into the middle of a sentence where possible. * Think about the arithmetic of this. Suppose a student has just a one in ten likelihood of mis-keying any given character. With a 3-character answer, she already has a 20% chance of getting wrong an answer she actually knows. Get up to 8 characters and the probability of accidental failure is over 50%. You can ameliorate the problem with Fuzzy Match, but that carries its own burden of partial marks. Either way, you fail in your summative aim of determining whether the student can work out the correct answer or not. 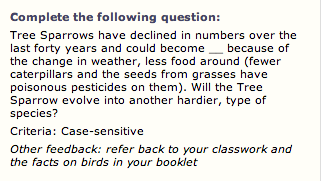 So: keep the required answer as short as possible! Each of these examples was pulled from the Yacapaca question bank. I used the preview from the Add Question search page. The correct answer here is “spelled”. 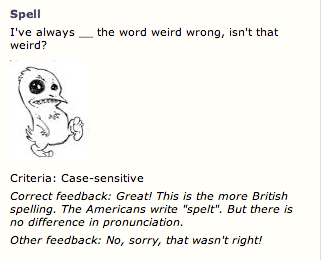 It’s from a TEFL course. I like the way the gap sits very naturally in the middle of the sentence, and also the correct-answer feedback that stretches the brighter kids just that little bit further. A nice juxtaposition of a an image with numerical input. 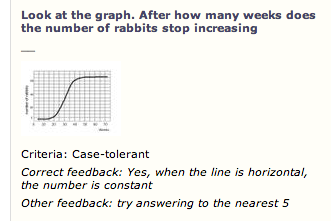 The feedback does indicate a problem though – if students answer to the nearest 1, or 10, they will miss the mark. From David Faulkes at Holyrood Academy, Somerset. In similar vein to the previous, a straight Maths question. 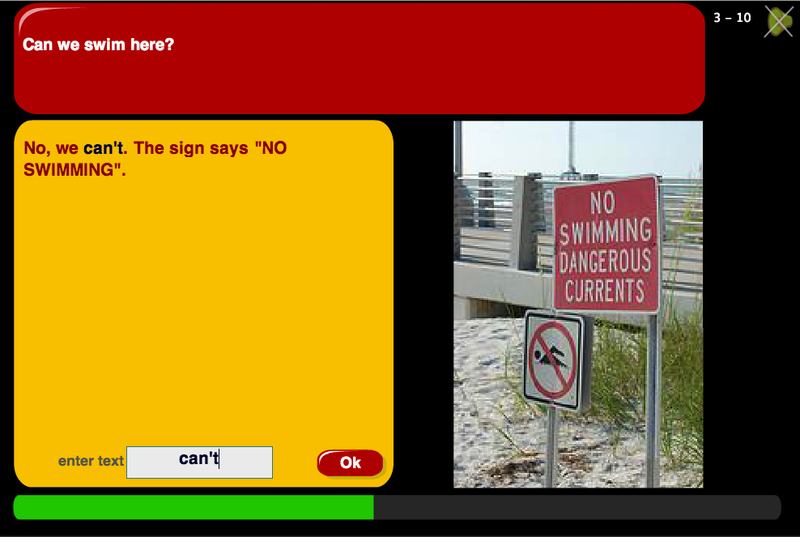 Personally I would not have put the correct answer in the feedback. From Kevin O’Driscoll at El Hogar Alternative Middle and High School in Tucson, Arizona. Yes, you really can use text this long in a Cloze, if it’s appropriate. I would have made this a fuzzy match, because ‘extinct’ is an easy word to mis-spell. From Darren Sowerbutts at Charles Darwin School in Kent. This is so clever. The picture provides a clue, and you work out the answer from it. I would have tried to solve this with a series of Locate questions (“click on G”, etc), but this is far more elegant. You could use it on all kinds of occasions where you want the student to identify a series of locations on an image. From Stuart Henderson at Marshall’s Park School in Havering. This entry was posted in Authoring, Yacapaca and tagged authoring, cloze, gap fill, MFL, question, question types, quiz, quiz authoring. Bookmark the permalink.